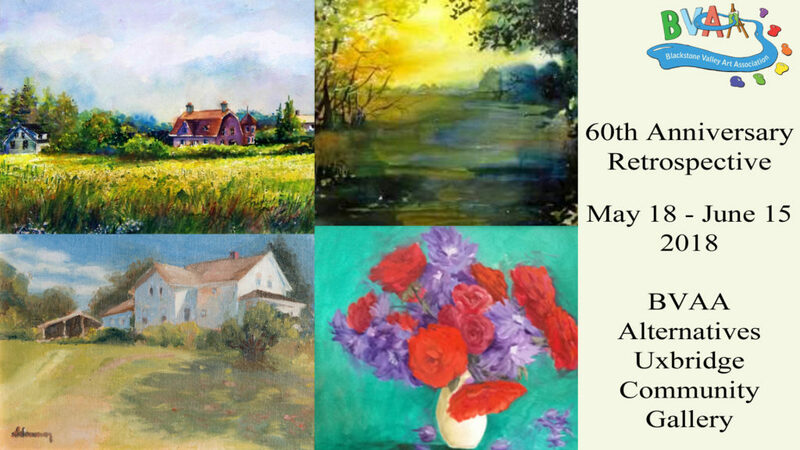 The Blackstone Valley Art Association has reached its 60th anniversary! It’s time to celebrate by showcasing the wealth of talented artists we have worked with, both past and present! Participation is open to all past and present BVAA members. Each participant may exhibit three works. A portion of all sales goes to support the work of Alternatives in the community. The fee for entering is $25 for up to 3 works. All participants must either be current BVAA members or have belonged to the BVAA in the past. The theme is wide open. You can submit a portrait, landscape, still life, abstract, seascape, you name it. Your imagination is the limit. To submit your entries use our BVAA Online Submission Form. The deadline to submit is midnight on Monday, May 14th, 2018. Work must be dropped off by Wednesday, May 16th, 2018 at 3pm. All work which is brought in will be hung (as long as it is properly wired and is family-friendly). We will hang the show on Thursday. The opening reception will be determined, probably Friday, May 18th. Invite family and friends – all are welcome! June 16th to June 18th, 2018, from 9am to 3pm. If you aren’t able to make that, contact us for other arrangements.